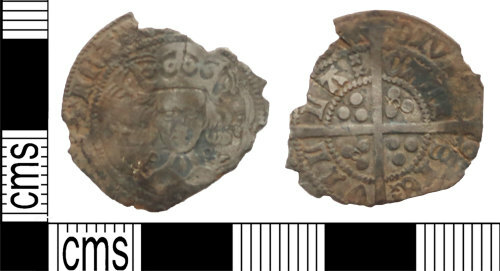 Incomplete silver medieval hammered groat of Henry VI, dating to 1422 - 1427 AD. Annulet issue. Calais mint. Obverse of forward-facing bust with annulets either side of neck; [....] FRA [......]. Reverse of long cross pattee with three pellets in corners and annulets in two corners; [..]/DIV[....]//VIL/LA/ CALI/SIE. The coin is 24.20mm in length, 23.64mm in width and 0.90mm in thickness. It weighs 2.34g.